Some people argue that English is one of the most difficult languages to learn, while others believe it is relatively easy. But unless you have learned many languages, it is, perhaps, difficult to say which is the hardest language of all to learn. How easy or difficult a language is to master also depends on your native language. If, for example, you are a native Chinese speaker, it might be easier for you to learn another East Asian language, such as Korean or Japanese, than it would be to learn English, as they are all closely related languages. Similarly, a native German speaker might find English easier to learn that a native Chinese speaker as English and German belong to the same ‘family’ of languages. That said, mastering the English language is certainly a challenge even for those brought up in an English speaking country. Whilst English does not have the complexity and abundance of grammatical rules that some other languages have, there are many strange little rules and, all too often, exceptions to those rules. It also has a vast and ever-increasing vocabulary – some say, of all the world’s languages, English is the richest – and an erratic spelling system apparently designed to confuse us all. The English language has a long history and has been influenced by numerous other languages, so it is not surprising that grammar, pronunciation and spelling rules are somewhat haphazard. Here are a few examples to illustrate the point. The plural of box is boxes but the plural of ox is oxen. Why? The end of the word box (ox) is pronounced in exactly the same way as the end of the word socks (ocks), and yet the spelling is completely different. Strange! The plural of the word mouse is not mouses but mice, yet the plural of the word house is not hice it is houses. How can that be? If we take the masculine pronouns he, his and him, logic tells us that the feminine pronouns should be she, shis and shim. As we all know, however, they are she, hers and her. That doesn’t make learning English easy, does it? So just how did we arrive at such idiosyncrasies within the English language? I’m sure we could write a whole new article if not a book on the subject but the simple answer lies within the long and varied history of the English language and perhaps too many cooks spoiling the broth. i.e. over the centuries, too many different groups of people have ‘taken charge’ of setting and adapting the rules, resulting in a whole host of irregularities. There are no shortcuts to mastering the English language; it takes time and dedication. However, if you are learning English as a foreign language, take comfort in the fact that even native English speakers struggle to get it right a lot of the time. 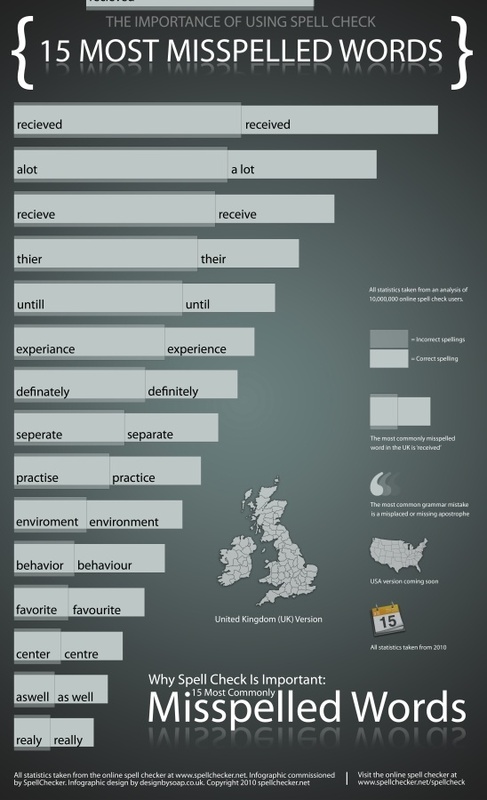 Take a look at the following infographics from grammar.net, which highlight the 15 most commonly misspelled words in the US and the UK. 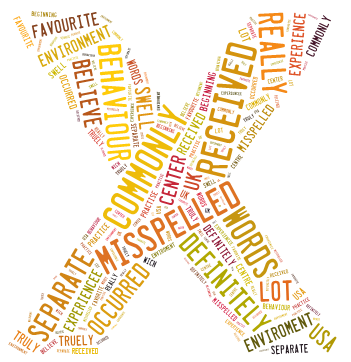 As you will see, the most commonly misspelled words are simple words that are used every day. And if you compare the two infographics you will see that 8 of the 15 most misspelled words are the same in both the US and the UK. 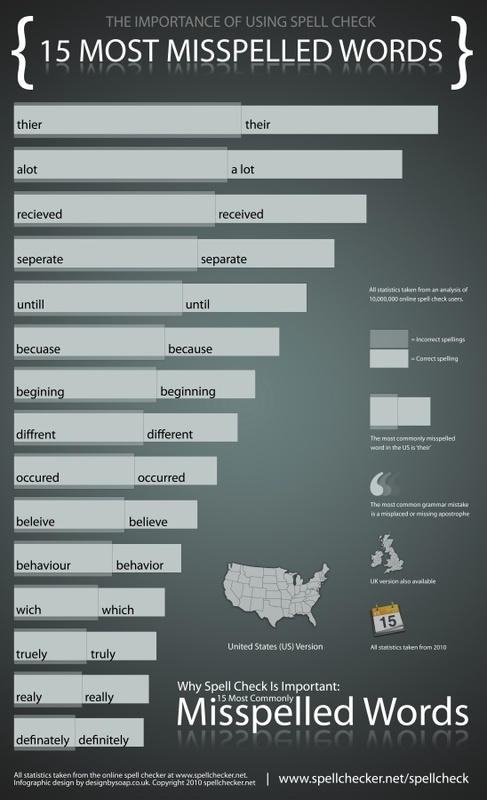 Learn how to spell these words and you will have the upper hand on many native English speakers. Don’t Be Afraid of Making Mistakes When Learning English – Mistakes are GOOD! ← Don't Be Afraid of Making Mistakes When Learning English – Mistakes are GOOD!